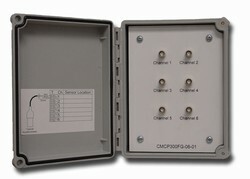 CMCP300 series BNC Junction Boxes Reliability Direct, Inc. Your Direct Source for Reliability, Maintenance, Test & Measurement! The CMCP300 series BNC Junction Boxes are multiple channel connecting centers for terminating the outputs of accelerometers or other transducer field wiring. They are normally located in close proximity to the machine to reduce wiring cost and provide convenient access to the vibration signal by a portable data collector or analyzer. The CMCP300 Series Junction Boxes are available in three (3) versions, ?FG? NEMA 4x Fiberglass, ?PS? NEMA 4 Powder Coated Steel and ?SS? NEMA 4x Stainless Steel. Tagging is provided for channel and wiring identification. The CMCP300FG Fiberglass NEMA 4X enclosure is made of molded fiberglass polyester and is easily punched or drilled. It has outstanding chemical and temperature resistance and physical properties. A seamless foam in-place gasket assures a watertight and dust tight seal. Screw covers are secured with captivated Monel cover screws. The CMCP300PS Powder Coated NEMA 4 enclosure is constructed of 14 gauge mild steel and is ANSI 61 gray polyester powder coated on the all surfaces.